It appears we live in a plastic financial world. 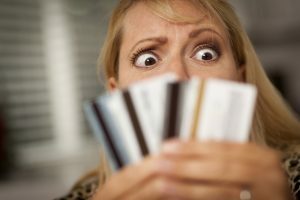 Banks and major retail companies promote credit cards; one because the interest rates which can be charged and the other for the quick, impulsive, purchases. It is all convenient, but plastic can generate a false sense of financial security. In fact, those little cards can damage financial wellness. Young people, those who recently graduated from college and entered the workforce, appear to be most vulnerable. They get offers in the mail for credit cards all the time. The temptation is almost too great, and they accept the offers and get the credit cards. It is then when trouble begins. It is not only the use of credit cards but also the number of credit card accounts established. These can have separate deadline dates, and they are quickly forgotten. People can accidentally miss a payment, but a string of consecutive missed payments is going to have a dramatic impact on credit scores. The confusion and problems created by plastic may require some outside help to allow a person to regain stability Countrywide Pre-Paid Legal Services provides such a benefit. It is part of our financial wellness program. There is no easy way to end the madness, but there is a correct way. It requires looking at each situation and determining the best way to stop the problem. Countrywide has a nationwide network of certified counselors who deal with debt all the time. The first step on the road to better budget management begins with a budget analysis of the current situation. The Countrywide experts will look at income and expenses. These professionals will determine what might be the best way to get control over credit cards and manage other debt. The options will be presented to the financial wellness plan member to generate the ultimate solution. Obviously, for many people, this is a very sobering experience. Some will blame themselves for problems that took years to develop. Our counselors are sensitive to the feelings of other people. What they wish to do is help a person find a better way to manage his or her budget. It can be paying off one credit card or paying only the minimum amount, so that a budget is easier to manage. The counselor presents the ideas and clients are often surprised at some of the solutions. They did not think of them before, but the Countrywide counselor knows the various alternatives are successful. The anxiety over credit card debt and other payment problems begins to decrease. Forward thinking organizations want to help their employees solve modern-day problems. Concern over credit card debt and other payments can drive an employee down. Employers do not want that to happen and they also want the very best for the workers. The Countrywide financial wellness program is meant to be tailored to need. The client chooses what will be in the plan, and it will be incorporated. Every individual who is part of a financial wellness program gets expert service and courtesy. The support comes right away.